Triple Curl is a popular heirloom curly-leaf parsley. Excellent flavour when added to salads or diced as a seasoning. 10-12 weeks to harvest. Each packet contains about 450 seeds. Parsley is a flavourful herb native to the Mediterranean. The first mention of this open-pollinated, heirloom parsley variety known as 'Triple Curl' being grown dates from 1865. Parsley is commonly used whole as a garnish but can also be diced and used in greater quantities as a flavouring in dishes. Parsley pairs well with potatoes, rice or fish. Eating a few sprigs of parsley fresh from the garden is a great way to cleanse the palate. If you're particularly fond of parsley you can even eat it as a vegetable, it is nutrient-dense and very healthy. Parsley is typically grown as a biennial in temperate areas, it will die back during Winter but reshoot from the roots as the weather warms. In cooler regions the cold may kill off the roots entirely so you'll have to grow parsley as an annual. In subtropical and tropical regions parsley is grown as an annual as the heat of Summer can cause parsley plants to bolt to seed which will kill the plant. You can pinch off the flowering stalks before they fully form to help extend the life of your parsley plants. 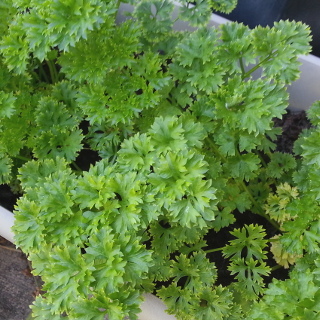 Parsley will self-sow through the garden if growing conditions are right. Plant in full sun in cooler climates or in a partially shaded spot in warmer areas. Parsley can be a heavy feeder, so be sure to dig lots of organic fertiliser, compost, well-rotted manures or worm castings through the soil prior to planting. Mulch around plants well to keep their root system cool, retain moisture and suppress weeds. Water regularly. In cold regions of Australia sow Triple Curl parsley from October to April. In temperate regions of Australia sow Triple Curl parsley from September to May. In subtropical regions of Australia sow triple curl parsley from February to May. In tropical regions of Australia sow Triple Curl parsley during the dry season from April to July. Sow Triple Curl parsley seeds no further than 4mm deep in the soil. Firm down the soil above the seeds to reduce moisture loss from surface evapouration and prevent the seeds from drying out. Thin Triple Curl parsley plants to about 30cm apart to give them plenty of room to grow. Triple Curl parsley can be slow to germinate, taking between 14 and 28 days. Triple Curl parsley is quick to produce, decent quantities of leaves will be ready to pick 10 to 12 weeks after sowing the seeds. Remove the entire leaf stalk when harvesting the leaves, leaving too many bare leaf stalks attached to your parsley plants may trigger bolting. Parsley 'Triple Curl' is an ideal variety for growing in pots and containers, or even your kitchen windowsill.